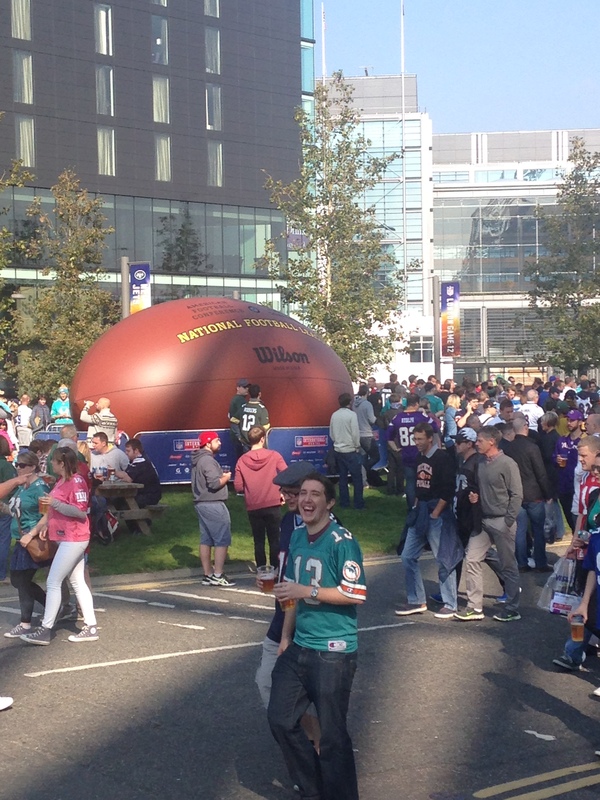 The NFL hosted its twelfth regular season game in London last weekend and saw the third-highest attendance. Among the crowd was a relative newcomer to the sport. Ben has adopted the Jags as his team, and has a season ticket for the 2015 games. Before heading into the stadium we enjoyed the pre-game entertainment located around the stadium, including chilli dogs which is always a necessity. The vast array of colourful jerseys is always a great sight. My friend’s number 81 Terrell Owens Philadelphia Eagles Jersey caught the attention of two wonderful American ladies, as they were from Philly, who we preceded to chat to about American Football and their previous week’s trip around the British Isles. After a while it transpired that they were the Mother-in-law and Sister-in-law of, the now former Miami Dolphins head coach, Joe Philbin. It was a bizarre but humbling experience being able to mingle and chat with individuals who are so closely linked with a professional outfit such as the Dolphins. Having come into the stadium on the team bus and spending most of the morning on the pitch, they were grateful to come outside the stadium and spend time with fans (and have a smoke). This showed to me the community-minded side of this sport. This kind of thing would never be seen in any of our home-grown sports. They told us that they attended a large number of the games with the team, home and away, and explained to us about how the team is very family orientated, with family functions after each game to get the kids and other halves of all the players and staff involved. The explained how Joe Philbin took an extremely proactive approach to his role at the club, and set the standard for players with a philosophy of hard work and often worked out with players. His mother-in-law told us that he would often return home after midnight, and was back out the door at 4.30am. We also asked about how the ticket prices were in comparison to the UK. At a divisional NFL game you could expect to pay anywhere between $100-150 for a game, with discounts given to season ticket holders, and costs spiralling as the Playoff and Super Bowl games are reached. At the home games they told us about the box that is hired for the coach’s wife (at a mere $30k per game) however, they were in the normal central seating for this game, and I think it was a welcome change. We also talked about how the money being taken out of the NFL was a great thing, and we talked about how this would benefit more European sports to stop their escalation of transfer fees. I asked them how they felt about the NFL games being held in London, and they told me that it was lovely to see so many teams being supported at one event and in such a nice and vibrant atmosphere. We also talked about how the Philadelphia Eagles are perceived to be the worst fans in America, but how the Buffalo Bills are by far the worst for fans, and never to go there! They did however tell us that the Green Bay Packers have the best supporters, and that the philosophy of the team being owned by the fans it really etched into the atmosphere of the entire franchise, and that if we were to visit only one NFL stadium that it be Lambeau Field (and of course the Miami Dolphins) but to go before October! I would like to thank them for their wonderful insight into the workings of an NFL organisation and also to help us see beyond the perceptions anyone could have in this country about the untouchability of the sport. It would have been great to chat more and despite the result, I hope they enjoyed their time in London!